In a mass radiological event, medical response and triage would involve large populations with widely varying radiation exposures as well as conventional trauma. Responding to the incident would require timely decisions on patient care, including the ability to identify the portion of the population likely to suffer from Acute Radiation Syndrome (ARS). The ability to prioritize treatment of victims likely to develop acute radiation syndrome (ARS) is vital in any nuclear response scenario. In a radiological event, the challenge of response is compounded by the delayed symptoms of ARS. The onset and severity of ARS symptoms is directly related to the dose of radiation absorbed, where the effects of damage to gastrointestinal organs can be seen in hours, hematologic system in days, and the central nervous system over weeks. Effective response requires a diagnostic method to identify which individuals need immediate versus near-term treatment, while transferring those among the concerned public out of the treatment path. REDI-Dx® is being developed to help estimate individualized levels of radiation absorption from a blood sample. For the emergency response teams, managing tens of thousands of victims with actionable information that can be integrated into platforms for response management is critical. 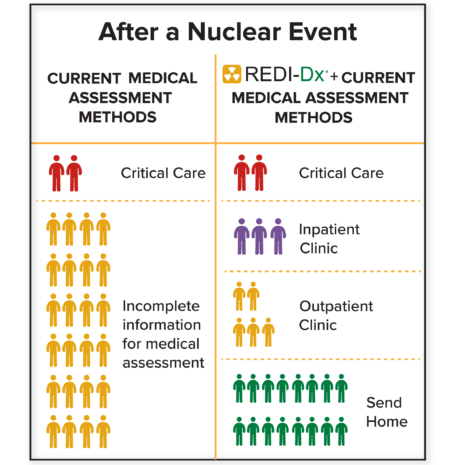 Table 1 illustrates an alternate scenario envisioned after a nuclear event when using REDI-Dx. REDI-Dx® is being developed to integrate into existing platforms and protocols for response management and patient tracking. Blood samples would be collected using standard phlebotomy methods into DxCollect® Blood Collection Tubes containing a solution that intends to stabilize the sample for up to 14 days without refrigeration, minimizing the complexity of sample handling and shipping. Once received at a qualified testing laboratory, high-throughput testing can be completed in less than one day, and results returned electronically through established reporting systems.